I nGaelscoil Chluain Dolcáin cuirimid clár leitheoireachta darbh ainm Reading Recovery ar fail do léitheoirí laga sna Ranganna Naíonán agus Rang 1. Cháiligh Sorcha Ní Chadhain, go ndéana Dia trócaire ar a hanam dhílis, mar theagascóir Reading Recovery i 2011 agus tá Caitríona Ní mhurchú ag leanúint leis an obair iontach a chuir sí i gcrích. Úsáidtear sraith leabhair, PM Plus chun tacú leis an gclár seo. Tá Gaelscoil Chluain Dolcáin tar éis €3,000 a infheistiú ar na leabhair seo. 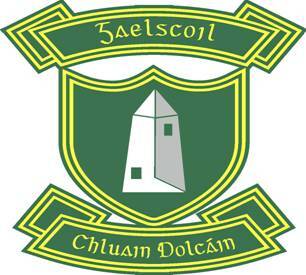 Tá ag eirí thar barr leis an scéim seo sa scoil. Tá an dul chun chinn déanta ag na léitheoirí laga agus tá a dtuismitheoirí iontach sásta. Reading Recovery is an early intervention programme which is designed to accelerate the reading and writing of children who have not responded to classroom teaching in their initial years of schooling. Reading Recovery is an intensive early intervention and it is taught and it is taught on a one to one basis. The goal for Reading Recovery is an exceptional one, to return the very lowest achieving children to average levels for their age as independent readers and writers in a relatively short time. The teaching is individually designed and individually delivered. Each child has an intensive half an hour daily which supplements classroom teaching. The focus is on comprehending messages (in reading) and constructing messages (in writing), so the highest priority is given to children reading many books and writing their own texts. This continues until the child is able to work successfully with the average group in the classroom. At the end of the programme (between 10 and 20 weeks) the child is able to work successfully with the average group in the classroom. As soon as one child leaves Reading Recovery another child enters. This continues throughout the year. Reading Recovery identifies early on children who are struggling to read. It reduces the need for extensive Learning Support on a long-term basis.